What is Horizon 2020 and why you should care? Horizon 2020 is the biggest EU Research and Innovation programme ever with nearly €80 billion of funding available over 7 years (2014 to 2020) – in addition to the private investment that this money will attract. It promises more breakthroughs, discoveries and world-firsts by taking great ideas from the lab to the market. By coupling research and innovation, Horizon 2020 is helping to achieve this with its emphasis on excellent science, industrial leadership and tackling societal challenges. The goal is to ensure Europe produces world-class science, removes barriers to innovation and makes it easier for the public and private sectors to work together in delivering innovation. If you ever wanted to apply with an awesome project, the good news is that Horizon 2020 is open to everyone, with a simple structure that reduces red tape and time so participants can focus on what is really important. This approach makes sure new projects get off the ground quickly – and achieve results faster. Here we have gathered the most eye-catching Topics from ICT industry that are waiting to win and be funded. AI and Cognition: AI provides tools to make systems cognitive. Cognition equips robots with the ability to interact with people and environments, to learn and to categorize, to make decisions and to derive knowledge. Cognitive Mechatronics: Mechatronic systems where sensing and actuation are closely coupled with cognitive systems are expected to deliver improved control, motion, interaction, adaptation and learning, and safer systems. Socially cooperative human-robot interaction: Cooperative human-robot interaction is critical in many work environments from collaborative support, e.g. passing tools to a worker, to the design of exo-skeletons able to provide motion that is sympathetic to the user. Model-based design and configuration tools: Deploying robotics at scale in application areas where tasks need to be defined by the user requires easy-to-use configuration tools. Embedding and sharing of knowledge between tools is essential, as is standardization across the interfaces to connect systems and modules (taking into account cyber-security issues, including security by design and data integrity). Improved technical capability in each of the core technologies over the current state of the art. A greater range of applications in the prioritised application areas that can be demonstrated at TRL 3 and above. The lowering of technical barriers within the prioritized applications areas. Interactive technologies such as Augmented (AR) and Virtual Reality (VR) are set to transform the ways in which people communicate, interact and share information on the internet and beyond. This will directly impact a larger number of European industries ranging from the cultural and creative industries, manufacturing, robotic and healthcare to education, entertainment and media, enabling new business opportunities. The challenge is to forge a competitive and sustainable ecosystem of European technology providers in interactive technologies. a) Establish a sustainable competitive ecosystem of European technology and solution providers for interactive technologies. “Smart anything everywhere” stands for the next wave of products that integrate digital technology. The challenge is to accelerate the design, development and uptake of advanced digital technologies by European industry – especially SMEs and mid-caps – in products that include innovative electronic components, software and systems, and especially in sectors where digital technologies are under-exploited. Proposals should address all of the following impact criteria, providing metrics to measure success when appropriate. Attract a significant number of new users of advanced ICT in the manufacturing sector, and more innovative technology suppliers, in particular SMEs and mid-caps. Creation of a sustainable network of Digital Innovation Hubs, providing European added value to investments done at national and regional level in Digital Innovation Hubs. Cyber-physical Systems of Systems (CPSoS), like transport networks or large manufacturing facilities, interact with and are controlled by a considerable number of distributed and networked computing elements and human users. These complex and physically-entangled systems of systems are of crucial importance for the quality of life of the citizens and for the European economy. At system level the challenge is to bring a step change to the engineering techniques supporting the design-operation continuum of dynamic CPSoS and to exploit emerging technologies such as augmented reality and artificial intelligence. At computing level the challenge is to develop radically new solutions overcoming the intrinsic limitations of today’s computing system architectures and software design practices. Availability of innovative technologies supporting compute-intensive applications in industrial and professional domains, demonstrating significant and measurable improvement over the state of the art. Availability of engineering practices and tools for CPSoS, resulting in a demonstrable improvement in quality and cost of development and operation for large SoS. Increased synergies and collaboration between industrial and academic communities; dissemination of high-quality road map for future research and innovation activities in the relevant areas. The challenge is to maintain Europe’s position at the forefront of advanced nanoelectronic technologies developments. This is essential to ensure strategic electronic design and manufacturing capability in Europe avoiding critical dependencies from other regions. Advanced nanoelectronics technologies enable innovative solutions to industrial and societal challenges. Proposals should address one or more of the following impact criteria and provide metrics to measure and monitor success. Identify applications likely to benefit from the intended approach with indication of key parameters (power, energy-efficiency, size, frequency, and cost) and quantitative targets to be achieved (figures of merit). Contribute to the mid-term viability of the European Nanoelectronics industry ensuring that new technologies with high potential for computing emerge in time to be taken up by industry. Sustain the technological integration requirements by focussing on challenging 3D integration issues as well as for electronics at cryogenic temperature. Contribute to the European industry capability to design advanced circuits for its needs. You can visualize the comprehensive list of all the ICT&FET Calls for Proposals by downloading this PDF file. If you have an innovative idea for a project you can always contact us for mentoring and support for every step of your application process. For the past few months, while we’ve been diligently ideating and building awesome software pieces, we’ve been also, in secret, building something new. Namely our new brand identity and website redesign. Digital world does not tolerate stagnation, and by knowing this firsthand we knew that we must have a differentiating voice and brand identity which is underlined by a bolder look. Nonetheless, tell a comprehensive story of the services and opportunities we offer. As well highlight our awesome team that works hard, has fun, and loves a challenge. We wanted our logo to communicate that we’re experts in our industry and we’re dauntless in what we do and how we so it. Our clients look to us for trust and confidence in our expertise, and assurance that the job will be done the right way — the first time. As our tagline says “The Code You Trust” — thus we needed to depict that visually. Ultimately, we found that simplicity is the way to go for our new identity, while being different through the new bold blue color and typography. We’ve conceptualized the new message we wanted to spread about our team and future teammates. Thus we came up with the “Do Something Different” tagline — because this is one of our core values — do try do something different everyday, be different, help & inspire others to do so as well. In the end, we created a new brand identity that fits our new voice, and we’re incredibly excited to share it with our clients and the the world. Refreshing a company’s look, vision and upgrading a website takes a village, but it’s totally worth it. The announcement of the new identity and website doesn’t mean this is the borderline, on the contrary – it’s just a new begging. As DAS Solutions lives and breathes, we’ll continue to improve, grow, create, build, and code so we can help other ambitious businesses thrive. Our work is never really done, the industry is fast moving, the work is gripping and change is expected — but that’s for sure a big piece of the fun. DAS Solutions is excited to announce that our SMS Gateway has been extensively integrated with JeraSoft Billing Platform for telecom providers. Now users are encouraged to take an advantage of using connected solutions aimed to successfully implement messaging services. DAS Solutions SMS Gateway is a carrier grade, in-house developed platform that gives telecom carriers and service providers the capability to offer their customers the entire range of messaging services. The platform has an impressively high throughput and the ability to manage SMPP and SS7 interconnections. The SMS Gateway performs intelligent algorithm routing management and comes with origin and content based routing capabilities. DAS Solutions is continuously working on upgrading the platform in line with the latest technologies and market trends. 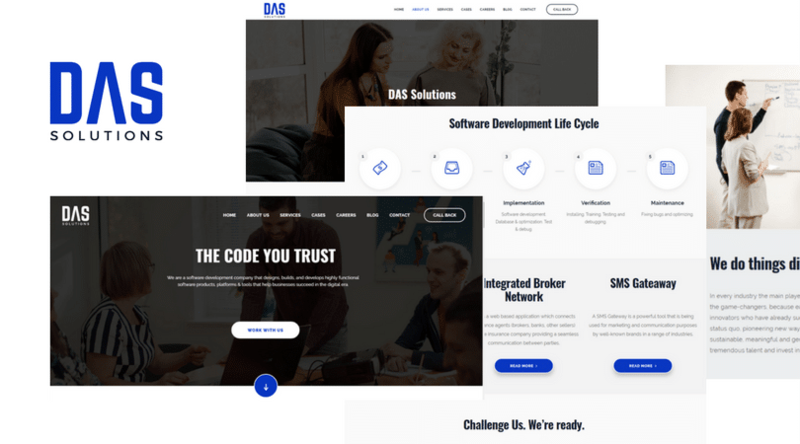 DAS Solutions is a software development company focusing on providing top quality services for businesses in a wide range of industries such as telecom, banking, insurance, E-health. Through its team of experts, DAS Solutions’ goal is to meet the existing and future requirements of the most demanding international companies. For more information about DAS Solutions please visit the website. JeraSoft is the leading developer and integrator of high-quality billing solutions for Telecom (Retail Services, Mobile VoIP, Business Telephony, OTT, Wholesale VoIP and SMS) and IoT/M2M providers around the world. Since 2005 JeraSoft has been putting together key insight and successful billing management practices, combining them with state-of-the-art web and telecom technologies. The result is a powerful platform the Telecom and IoT providers can use to streamline billing processes and add value to their business. For more details about DAS Solutions SMS Gateway configuration for JeraSoft Billing Platform, please look through our Integration Manual here. The NEM Assembly is taking place at the Crowne Plaza in Brussels today. The aim of the event is to share the updates and get feedback from the participants of the General Assembly on ongoing projects such as I2C PPP. New applications will be created that can be possibly used on new devices. I2C PPP will create new opportunities for converged business models between content and telecom, broadcast, consumer electronics, etc. The project fosters the effectiveness of communication that will contribute to intellectual and leisure well-being. During the NEM Assembly, members will also discuss other new and exciting projects throughout the day. Multimedia writing robots, augmented reality, brain-computer interaction and the new generation of the UHD visualization are only some of the topics that will be addressed. Tomorrow, March 16 2016, the European Commission is organizing an information day for potential applicants to the call for proposals ICT19-2017. The call addresses “Media and content convergence” to support Media Industries under the Horizon 2020 initiative where DAS Solutions has been an active participant. Media and content created in Europe are diverse and captivating, however to keep ahead of the competition on the global market, the industry has to become more technology oriented. The sector has to be more adaptable to new technologies and to be able to reach wider audiences. 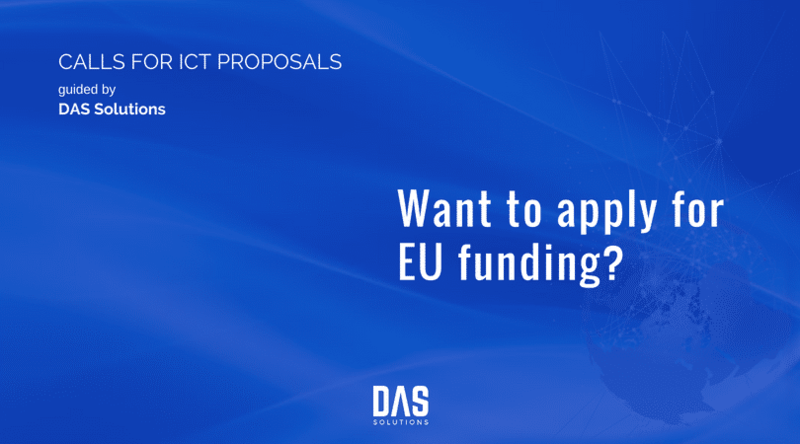 Participating at various events such as the NEM Assembly and being active in such programs as Horizon 2020 is a part of DAS Solutions’ strategy to provide the most relevant services on the European market. We aim to provide high quality IT solutions for various industries, to support young programmers, and give back to the community in which we operate. DAS Solutions is synonymous with custom software applications. This is proven not only by our commitment to technical excellence, but also by our support of young programmers (as well as those young in spirit) and their own exciting IT projects. This is why, as part of our social responsibility program and in collaboration with DAS Foundation, the Moldovan Academy of Sciences, and the European Commission, we are organizing an IT-only Science Slam Moldova event on March 31, 2016. The presenters must be the ones who contributed the most to the development of the custom software applications that are presented. The presentation of the custom software applications must be engaging and short (7 minutes tops). The presenters must be able and willing to answer any technical questions about the developed custom software applications from the audience. The goal of the event is simple. We want to develop the presentation skills of software developers in Moldova. We have very talented IT specialists in Moldova, and they deserve to be encouraged and supported continuously. Only through constant collaboration between them can there be a continuous flow of high quality services provided to customers around the world. The custom software applications presented at our event will be cutting edge, engaging, and importantly, they will have a positive impact upon organizations and companies from Europe and around the world. Join us at Draft Arena (Bd. Dacia, 55) on March 31, 2016, starting at 18:00. Yes, the event will be held in a pub! During the previous 4 editions of Science Slam Moldova we have witnessed many interesting and creative presentations. DAS Solutions has stayed close to young talents and invested its time and energy to help presenters do their best. This week, four winners of the previous battles are going to present their works and we will find out who is the Slammer of the Year. The topics vary significantly, which makes the event even more compelling for the general public. One of the participants, Alexandr Iscenco, is going to talk about 3D printing, robotics, open-source, ecology, and the future. He will present the findings of the research he conducted in Germany on this topic. Primarily, he will discuss the future role of robots and 3D printing in our lives and the progress already made since the invention of 3D printing. During the Science Slam Final Battle, we will have the opportunity to find out about the influence of contagious diseases on the Moldovan history and about the ways authorities managed to deal with epidemics during the interwar period. The Slammer Alexandru Ghetan will shed light on this and many other things during the Final Battle of the Science Slam. Another Slammer, Dr. Iulia Iatco, will discuss algae, cyanobacteria, and their structure. The scientist mentions that algae are not currently used at their full capacity around the world. Algae can be used in alimentation (thanks to their vitamins and microelements), but also in waste treatment (wastewaters can be cleaned effectively and responsibly using algae), agriculture (domestic animals can be fed with the biomass from microalgae) and many other industries! A well-known ethologist, Dr. Dorian Furtuna, will discuss aggression, the reasons that lead to it, and its effects. He has recently published a book that explores the causes of human aggression and the reasons behind wars and explains why military conflicts keep happening around the world. Science Slam is an event that brings together talented scientists and innovators with the general public and promotes new and exciting topics and ideas. DAS Solutions is proud to be a partner of Science Slam Moldova. Investing money and time into something dear to you is important, but often it only takes encouragement and support to kickstart one’s project. DAS Solutions actively supports young scientists who are interested in latest technology. We find young scientists in the IT sector (and others) and make their voices heard. DAS Solutions is one of the organizers of Science Slam in Moldova. Science Slam is an event where young people prove that research is fun. Scientific research from all disciplines is presented to fellow researchers, representatives of research institutions, policy makers and the general public. The idea of presenting scientific discoveries in a captivating and creative way originated in 2008 in Germany. Since then, the idea of running such events spread throughout the world. Now Science Slam takes place in North America, Brazil, The UK, Austria, Denmark, Finland, Russia, Luxembourg, Sweden, Switzerland, China, India and Japan. We aim at making Science Slam an established tradition here in Moldova. On December 8, a Moldovan Robotics student will present the robot that she and her friends created using latest technology. The robot is controlled by a mobile app and it has recently won a gold medal as a participant in an exhibition of innovations in Moldova. Another young researcher will discuss how latest technology can help doctors doing ultrasound scans diagnose patients more accurately. The participant (or “Slammer”) will present the ways in which the system can be implemented and its advantages. Usually caterpillars are combated using chemicals that damage both the environment and agricultural products. A Slammer from Moldova came up with an idea to fight insects using a virus which affects only caterpillars. According to his findings, the method is eco-friendly and does not have a negative impact on the products. Another Slammer comes from the domain of psychology. She will discuss the various sources of stress among children, and the connection between latest technologies and stress levels among teens. She will come with a set of recommendations and tips for parents everywhere to lower this impact. Young scientists who are interested in latest technology discoveries must be supported, because they are the ones who come up with original solutions for existing problems in all areas. DAS Solutions invests its time and resources in the future of a better world. We would like to announce that recently DAS Solutions became a member of NEM. Many major European organizations that work in the electronic and networked media area, as well as in content provision, broadcasting, network equipment manufacturing along with some network operators, service providers, academia members, standardization bodies and government institutions are members of New European Media. NEM’s aim is to support the convergence between telecommunications, broadcasting and consumer electronic to foster the business of networked and electronic media. The initiative focuses on the improvement of user experience as well as on innovative applications and personalized services that are in different media forms. The main goal is to promote the development of media and communication environments and the content generated by end-users. Design of media content by both professionals and non-professionals supported by different tools for content creation. This includes the creation of classical and new media applications for different audience. Establishment of complex networks with universal and seamless service provision. Creation of different multimedia devices such as gateways for home and mobile devices with innovative features. Also development of application programming interfaces for new creative applications. To support young talents and IT professionals who wish to make a difference in the world. To participate actively in NEM Summits that take place throughout the year. To create solutions that add value to software development industry such as applications that create awareness about problems communities face in the contemporary society. DAS Solutions is looking forward to new possibilities as a stakeholder of NEM Initiative. If you have an idea that you always wanted to realize let us know.